Humanity has amnesia. What trauma was so great that it caused an entire race to forget where they came from? 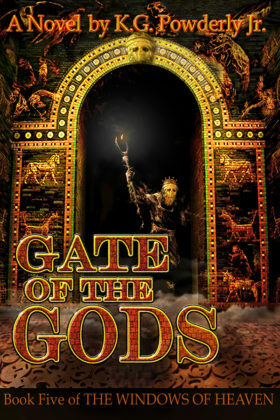 In Book V of The Windows of Heaven, the Gate of the Gods promises new hope and a new direction, but leads humanity instead to the threshold of madness. A tiny civilization grows again in the wake of the global catastrophe, several generations past. A ziggurat under construction broods over settlements that seek the knowledge, power, and comforts of a world their parents saw destroyed by flood and flame. That knowledge still exists, waiting in the sacred cities of Arrata beyond the Mountains of Weeping Stone, for the return of the Sun Ships, which departed a generation ago to explore the chaotic new globe. The Lord of Arrata, and the Haven’s keeper, Ninurta, fear the ships are lost with their commander, the Steward-Priest U’Sumi, who survived the global cataclysm in his youth. When a young Khaldi sage discovers a dark conspiracy climbing all the way to the highest levels of the new world’s government, he must embark on a treacherous journey to warn the city of his ancestors at the Treasure Cave of Arrata. There, the repository of the previous world’s technology awaits the resources needed for the planned rebirth of high civilization. The Conspirators plan for a different kind of rebirth, however, one that uses the old powers to build a world of their own design. Book 5 of the The Windows of Heaven series, Biblical fantasy for young adults and older.